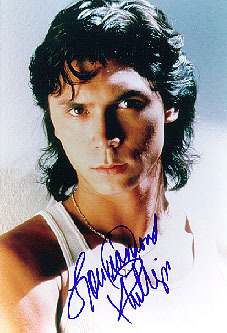 Lou Diamond Phillips is a multi-ethnic American actor, best known for playing the doomed rocker Ritchie Valens in La Bamba with Elizabeth Peña, and a Mexican-Indian desperado in Young Guns with Kiefer Sutherland. Phillips' father was of Scottish, Irish, and Cherokee heritage, and his mother was part-Filipino, part-Hawaiian, part-Chinese, and part-Spanish. His smorgasbord ethnicity has allowed Phillips to play a Latino kid taught calculus by Edward James Olmos in Stand and Deliver, an Eskimo in Shadow of the North with Toshirô Mifune, and a Navajo in The Dark Wind with Fred Ward. He was Tony-nominated for his Broadway turn as the King of Siam in The King and I. As a struggling actor Phillips taught drama, and he was asked to rescue an independently-made film that was unable to find a distributor. He re-wrote the script, added a few scenes, and cast himself as one of the villains, remolding the film into a curious but undenibly improved low-budget thriller called Trespasses. After several early-1990s successes, his career has faltered. On TV's short-lived Wolf Lake, he played a cop dealing with werewolves. Much of his recent résumé, however, consists of forgettable TV films and low- and lower-budget films that have barely been released, including Route 666 with Lori Petty and Alien Express with Todd Bridges. Phillips has also directed several episodes of Outer Limits and The Twilight Zone. In his spare time, he plays with a rock band, The Pipefitters. In December 2006 he pled guilty to domestic battery on his live-in girlfriend, who was not publicly identified. He was sentenced to three years' probation, one year of counseling, and 200 hours of community service. He was named in honor of Leland "Lou" Diamond, a US Marine gunnery sergeant who fought in both World Wars, including heroics at Guadalcanal.